As I write it is a rare opportunity to be listening in person, to John MacArthur, Al Mohler, Mark Dever, and others here at the Shepherds’ Conference in LA. They are doing a Q & A which is very interesting. All of these men are known here and around he world. What a privilege for Graham, Chris, Caleb, Vladimir, and myself to be here with many others we know too. Nancy is being grandma with the grandkids at our son Ezra’s home. Thanks for praying for us. Her neck pain is much better. Me with my son Caleb and his father-in-law, our mission associate Vladimir. My friend Vitaliy Shipuk surprised us. I knew him as a child in Odessa and in Makarovo. He is now a second year student at the Masters’ Seminary with plans to become a pastor in a Slavic church. What a blessing. The conference theme is Faithfulness. Isaiah 26:4 “Trust in the LORD forever, For in God the LORD, we have a everlasting Rock,” It is also MacArthur’s 50th year here so he gave the first message about God’s grace working through him. He discussed the sin of pride which we all struggle with and emphasized the work was God’s work and not John’s. It was a challenge to all of us. Most of the conference main sessions you can watch live or watch later at www.shepherdsconference.org when they are posted after the week is over. There are about 4,000 Christian pastors/leaders here. About 1,000 volunteers from the church serve us making us feel welcome. They serve the breakfast, coffee, lunch, and many snacks all day long. I’ve been coming since the early 90’s. This conference has been a great help and encouragement for me. Click here to hear 3,000 men singing with us. We also worship in song. This week Irish Christian music writers and musicians Keith and Kristyn Getty are leading in some of the music. It is amazing to praise God with thousands of others in the auditorium. 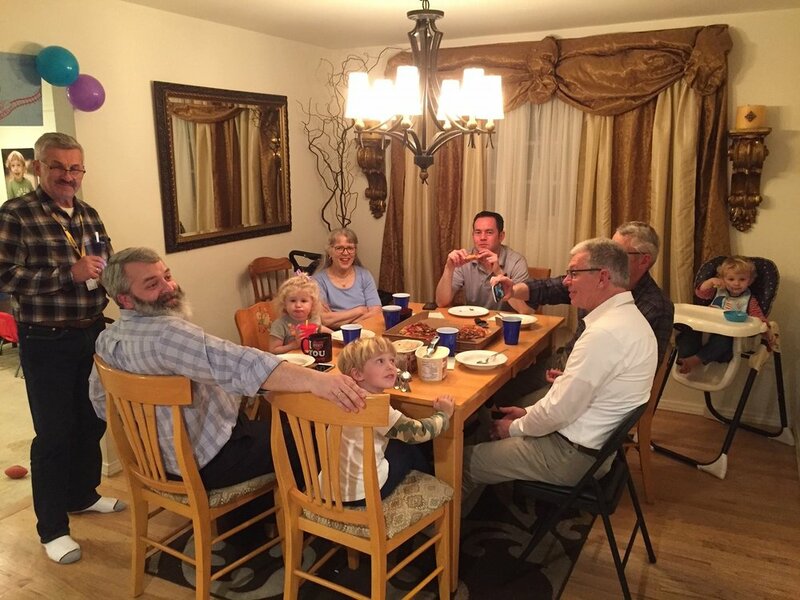 Our team gathering at our son Ezra’s house for pizza after the last service of the evening. After the conference is over on Friday some of our team will go home. Nancy, Caleb and I will visit friends, and go to a local church with our son Ezra’s family. Later we will go to Chile to see our granddaughter Naomi and family and our first great-granddaughter. We’ll send pics. Caleb, Nancy and I will be doing some ministry in the churches there also for the next few weeks. Pray that we might be helpful to the people during that time. -Pastor Mark along with our Team.